Julius Dikirr charged with murder of Sikona Ole Munet at Milimani law court on Wednesday 2 September, 2015. Three Game wardens linked with the killings of a protestor in Narok during demonstration against the Narok County Governor Samuel Tunai seven months ago have been charged. 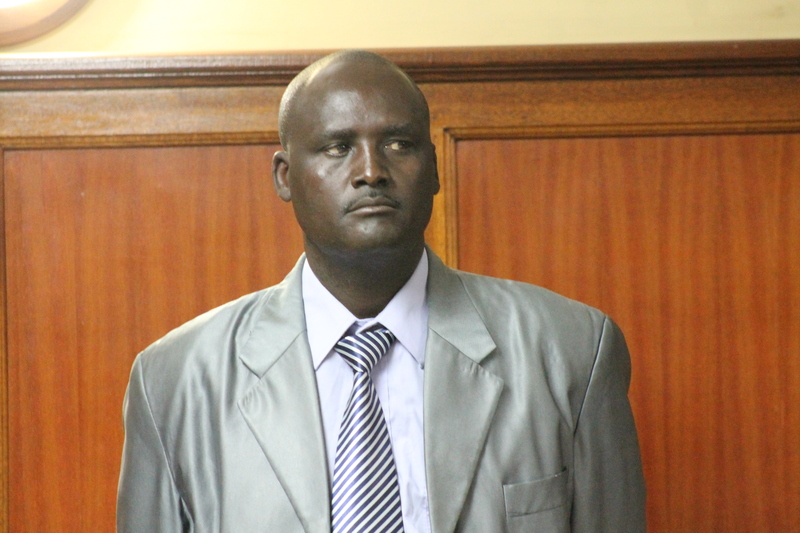 Julius Dikirr was charged with the murder of Sikona Ole Muntet on January 26 at Narok County Government headquarters. Warden Moses Kuiyoni faced a charge of attempted murder of Amos Kosion Losaloi by shooting him during the fracas. Their co accused, Samuel Kishoyan was charged with causing grievous bodily harm to James Kimpila Ntempei on the same date. The four denied four counts before Chief Magistrate Daniel Ogembo at the Milimani law court today morning. Dikiri who separately appeared before high court judge Jesee Lessit did not plead to the murder charges. The judge instead directed the prosecution to take him to Mathari mental hospital for mental assessment before he is arraigned in court on September 18 to formally plead to the murder charges. Director of Public Prosecution made an application seeking to remand the accused until the matter is heard and determined due to security reasons. The investigating officer Pauline Njoroge in a sworn affidavit states that investigation showed that the accused persons were culpable for the offences as started in the charge sheet. DPP through Duncan Ondimu said the accused are facing serious offences and if released on bail they are likely to abscond bail and interfere with witnesses who are based in Narok. “Based on the seriousness of the offence, the sentence to be passed if convicted and the evidence gathered so far ,there is a high likely of absconding by the accused hence them being flight risk” said in his affidavit. He argued that the accused are licensed fire arm ho;lder and they are still employees of the Narok County Government where the crimes were committed and the witness in the case facing the accused are based in Narok county. “The accused are based in Narok County and due to the nature of the employment of the accused, there is a high likehood of interfering with witness” said Pauline in her affidavit. He said the witness in the cases suffered serious injuries which led to serious disability and they are vulnerable witness. He further argued due to current prevailing volatile situation in Nairok County and considering public interest, bail should not be granted. He also opposed the accused to be released on bail due to their own security and prevailing volatile situation in Narok County the accused security cannot be guaranteed. However, the accused lawyer Kangai objected to DPP application saying the issues raised in the affidavit were speculative and the accused learnt about the arrest warrant through newspapers. The suspects through their lawyer they told the court that they presented themselves to court after they learnt that a warrant of arrest had been issued against them. Ogembo said he will deliver the ruling on Friday at 11 A.M whether to release the accused on bond or not. On Friday last week Senior principal magistrate Martha Mutuku said that arrest warrant issued against Moses Kuiyoni and Samwel Kishoyan , but directed that they appear before Capitol Hill police station on Monday 31 for purposes of recording statements. Omogeni told trial magistrate, that it’s in good faith that the suspects have appeared in court and it’s upon the court to exercise its discretion and lift the warrant. Narok Senator Stephen Ole Ntutu and four MPs who are under investigations over chaotic demonstrations late January 2015 warned them to desist from taking part in any demonstration. the DPP dropped incitement to violence charges against Senator Ntutu and four MPs Johana Ngeno (EmurwaDikir), Moitalel Kenta (Narok North), Korei Lemein (Narok South) and Patrick Ntutu (Narok West). The five were discharged after the DPP found no evidence to prosecute them. The DPP urged the court to release the five suspects on bond saying he had received information that chaos had erupted in Narok the same morning as residents protested the arrest of the politicians. During the protests, one person was injured while businesses remained closed as angry youths barricaded roads leading to Narok Town.